Above: Responsive website design for Certified Haircolor Products (via Rigney Graphics). Wireframes and hi-fidelity mockups in Adobe Illustrator, final asset delivery and image editing via Photoshop. 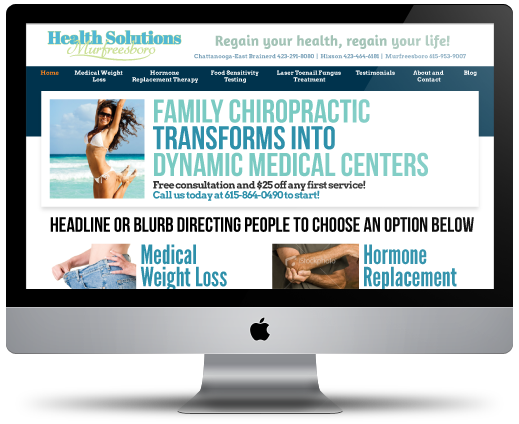 Website design for Health Solutions/Dynamic Medical in Murfreesboro, TN. The website was built on the Wordpress platform, and features a strong, flexible grid structure and modularity to make it responsive and mobile-friendly. I acted as visual designer, working entirely in Adobe Illustrator, and handed off all of the final files, specs, and assets to their developer once the design phase was complete. Website for Melody Edens Salon in San Antonio, Texas. Designed in Adobe Illustrator and Photoshop, for deployment on Wordpress. For Rigney Graphics in Pasadena. Responsive website design and deployment Getmovo.com, designed and built to launch a new tech wearable, the Movo Wave. The site launched smoothly and spearheaded the rollout of an international promotional campaign that kickstarted sales of their new tech. Movo needed a handsome, flexible, mobile-responsive website quickly and economically. The site was designed and built on the Squarespace platform to save time and ensure the final site was beautiful and immediately optimized for tablets and mobile devices. Branding update and web application UI re-design for DrunkDuck.com / TheDuckWebcomics.com. Working as an Art Director with WOWIO, an e-book publisher and distributor, one of my primary projects was this redesign of Drunk Duck, a massive webcomics-hosting sites (about 100,000 users, about 25,000 comics). They were reprogramming the site from the ground up in Python, and wanted a design overhaul to go with it. The original DrunkDuck, built before they acquired it, had been clattering along for a few years on a patched-together code base, in the grand tradition of seat-of-your-pants development. The old site needed to be rebuilt with new code, new databse structure, etc., to modernize it and improve performance and scalability. WOWIO wanted to really grow the community there and improve the overall user experience for the long haul. I did a lot of work on this project, from redesigning the original Drunk Duck logo to completely overhauling the site design from the ground up. My contributions included a new logo design (two, in fact), overall graphic design, art direction of original spokes-cartoons, icons and badges – really every pixel of design on every button and headline – saved out and delivered as assets to the dev team for implementation. Quite a project. The Front Page, with login module, Twitter feed, a Featured Comic slider, Top Comics, a site blog, and nav to the major sections. Interior pages. A video collection wall; a comics browser with tag filters; a podcast page; a comic reader interface (the white page); a forum section with two page views. A series of badges designed for DrunkDuck.com, to serve as branding for the various content sections of the site. BELOW: Design sequence, from low-fi wires to hi-fidelity mockups, asset output and handing everything over to the in-house developers. Content wires, working out exact sizing and spacing. Tightening up with typesetting and actual graphics. Sequence with hi-fi mockup and guide notes for the devs. Website design for Wilkinson Animal Hospital, built on the Wordpress platform. The brief was for a friendly, comforting look that would reassure pet owners that their animals would be well taken care of. I decided to keep it colorful and simple, with friendly type choices that would accommodate all of the required content and still have that classically reassuring emotional appeal. The challenge was including all of the front-page content hooks that their existing site had, but organizing it in a way that made it all more easily discovered by the users, and therefore more actionable. I wound up using a segmented grid approach that would give nice big content blocks, and establish enough structure to derive the other pages throughout the site from the same grid. The design included plenty of space for content generated by the clinic (photos, videos, news, etc.) as well as custom icons and illustrations for the various site sections (dogs, cats, forms, etc.). Website for Jet Black Entertainment, Seattle-based transmedia, merchandising, and entertainment brand development agency.